With two of my shooting permissions cursed by the return of myxomatosis, I was pleased to be offered the shooting rights on a large public park, where a growing population of rabbits, were beginning dig up the carefully manicured cricket pitches. Due to public access, the permission was granted between the ours of dusk and dawn, with the stipulation that air rifles only were to be used. Already fitted with a push button torch that can throw a tight beam a hundred yards, I took my two shot, Webley Viper Venom PCP .22 along for the first walk round, arriving well after sunset to find that the park was popular with evening dog walkers. Keeping the rifle in it’s slip, I toured the likely looking holding areas, which included a wooded railway embankment and a stand of horse chestnut trees, where one of the wooden cricket pavillions was situated. In the gloom beneath the trees a few rabbits were chasing about, but were gone under the pavillion, before I could unzip the Webley. There was a strong odour of rabbit from the building, which was mounted off the ground on slabs, where several rabbit runs were visible. I decided to stake this area out, sitting on a fallen tree in cover, with a view of the back of the pavillion, any rabbits emerging from the runs would give good warning, due to the dry leaf litter. After 10 minutes, the faltering rustle of leaves warned of an approach behind me. I spun round to face the the animal, which stopped in it’s tracks. Straining my eyes and ears, I made out a lighter shape moving slowly left to right about twenty five yards away in the direction of the pitch. Once on the pitch it would be an easier target, but plumbed for “a bird in the hand is worth two in a bush” theory and flicked on the lamp to reveal the trotting rabbit. A stationary shot would have been aimed at the head, but now I fired at the chest. It jumped and turned back to the wood, stopping near a tree. With one shot left, the crosshairs settled just behind it’s eye. Phut! It toppled over. With the extra silencer attached to the shrouded barrel, the report from the rifle sounds weak, but at 30 yards the .22 pellet has all the hitting power to stop the largest of rabbits. Although in apparent perfect condition, the white area around it’s closed up eyes were early signs of myxomatosis. I put on my rubber gloves, before picking it up by the hind legs and throwing it deep into a bush, where it would be out of reach of nosy dogs. Some people say that rabbits in this condition are safe to eat, but I prefer not to tempt fate. I went back to the stake out and waited for the tell tale rustle. This time it came from the pavillion and I flicked on the light to see the white tail and heels of a rabbit, bobbing round to the front of the building. Nipping round from my end, the rabbit was sitting bolt upright in the glare, I raised the rifle and fired. In that instant it was gone. Had I hit it, or missed? I swept the area with the beam and walked around the building. Nothing. I’d now made too much disturbance and headed down to walk the embankment. Rabbits could be heard in the deep undergrowth, but I needed one to come out of cover, shining the torch among the nettles, seeing only the ghostly movements of unhittable targets as they made for safety. Along the path, a shape appeared, a rabbit with it’s back to me, taking my time to aim into the neck between it’s ears. 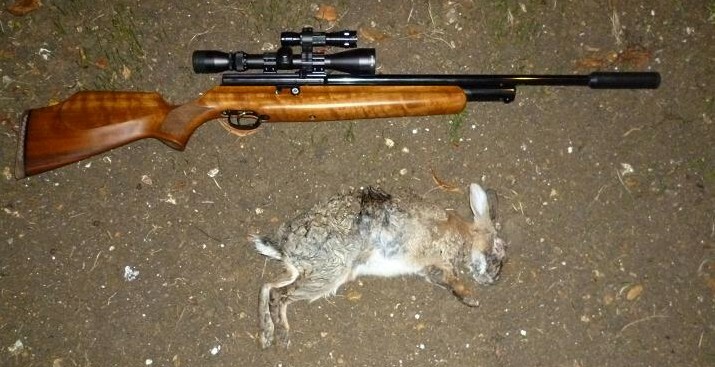 The thwack from the hit drowned out the rifle, the rabbit falling forward without a twitch. Going over to the kill, my elation fell away with the sad sight of a rabbit in the final stages of myxomatosis. This had been a mercy killing. The disease is caused by infected fleas, which create sores, that the rabbit will scratch until it draws blood, while the eyes swell up oozing puss. Myxomatosis was invented by man and introduced into Australia, where it devastated the rabbit population, it’s intended aim. After World War II, commercial warrens were no longer viable in England, as cheap meat from the Commonwealth became available and this painful disease was introduced here with similar effects. Today such a method would be banned, but strains of the disease continue to flourish in the wild rabbit population. Some are immune, others recover, but it is something once seen, never forgotten. Sidelined from any form of physical effort, due to a damaged tendon in my fishing arm, I was finally free of it’s protective sling and under advice from the doctor to begin some moderate exercise this week. With this in mind, I emptied my tackle box of all but my pole fishing essentials, loaded up the trolley and set off on foot toward the local pond. The weather forecaster on TV, had just assured me that it would be mainly dry with the odd spit and spot of rain, so in the interests of a light load, the waterproofs had been evicted from my bag to be replaced by a once shower proof jacket. Two other anglers sat side by side in my intended spot and I moved twenty yards round the bend, where there were gaps in a weed bed, although in front of me was a solid wall of greenery and brambles. Also turfed out of the tackle box had been a sturdy pair of secateurs, leaving me with only a 2 inch bladed penknife to cut an opening through the tangled jungle. Fortunately, during my enforced recuperation, a review of my tackle had relieved a couple of hours of boredom, during which this usually blunt knife, won many years ago at a Christmas Match, had been honed on a stone to a dangerous level of sharpness. Making short work of the green saplings and more stubborn brambles, 15 minutes with the knife produced a hole large enough for the pole, which coincided with the spits and spots of rain turning into a steady downpour. 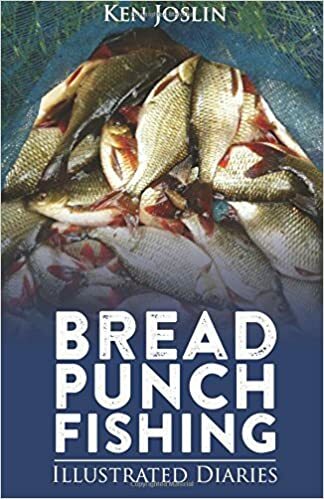 Rough bread crumb, hempseed and a bag of sweet corn had been retrieved from the freezer before lunch, the combination now added to ground fish pellets to make a soft ground bait, ideal for this shallow pond, with four good balls lobbed 8 metres out to the edge of the weed bed. With immediate effect, rudd were splashing on the surface mopping up the larger pieces of still floating bread, which allowed time to set up my stall, selecting a small home made waggler rig with the hook line to hand on the top three sections. The hook was a size 14 barbless, just right for sweetcorn. By the time I was ready to fish, the surface seemed clear of rudd, but the float sliding across the surface said otherwise and I lifted into a better specimen, that skated into the weeds, throwing the hook. 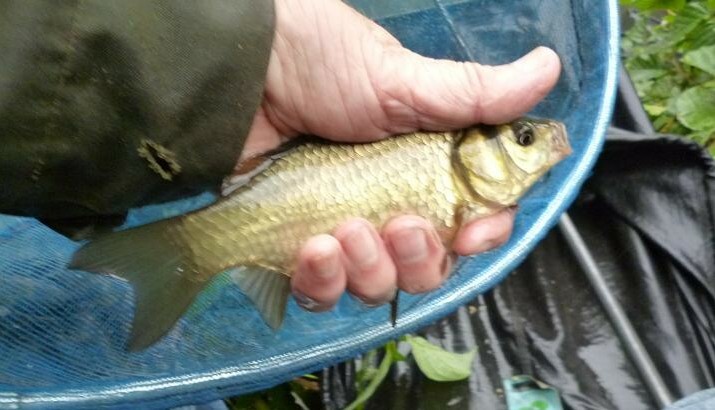 Half a dozen smaller rudd stayed on long enough to be swung to hand, before a cast that saw the float settle and sink to the tip. It bobbed, then lifted a fraction, to moved slowly away and under, a classic carp bite. The strike was met by a rapid, elastic stripping run into weed on my left and keeping an angle on the pole, fed it back behind, where the high bank forced me to unship two sections, then another two, as the common carp was drawn toward the bank. Now with the top three sections in hand, the 12-18 elastic did it’s work and the pound fish was guided to the net. Next cast, a similar bite, another carp in the weeds, but this time just a bunch of weed, the hook being dumped. 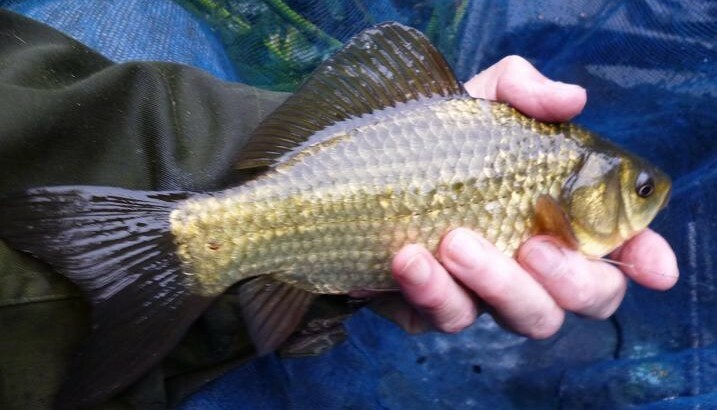 Back in, a dithering bite resulted in the juddering fight of a decent crucian carp, that was soon in the net, the hook only in the skin of the lip. 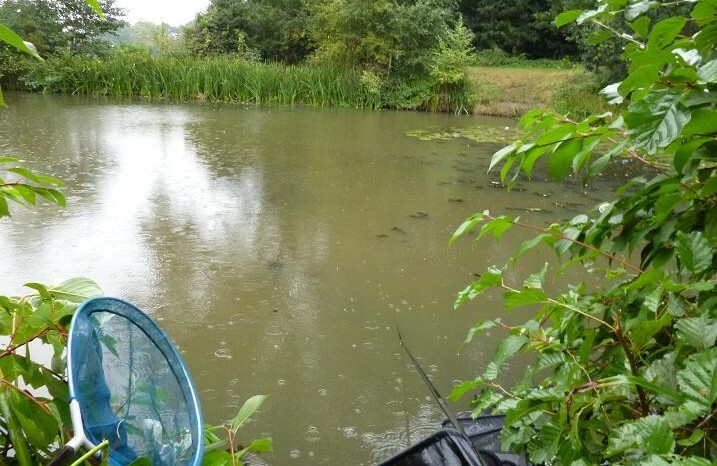 Bubbles were now popping up among the raindrops and the fish had their heads down, intercepting the sweetcorn on the drop, as I had slid the shot up around the base of the float. Next out was another small common, still fighting when the hook was removed. I now lost three crucians on the trot. They were gliding away with the corn, only lightly hooked and twisting off, even against the elastic, the hook falling out of the next, once the pressure was off in the net. I cut off the barbless and tied on a size 14 whisker barb hook, my wet hands coping with the whip knot more by muscle memory ,than anything else. This did the trick and even the lightest penetration held. This carp had a massive fan tail, testament to the mix of fish in the pond. 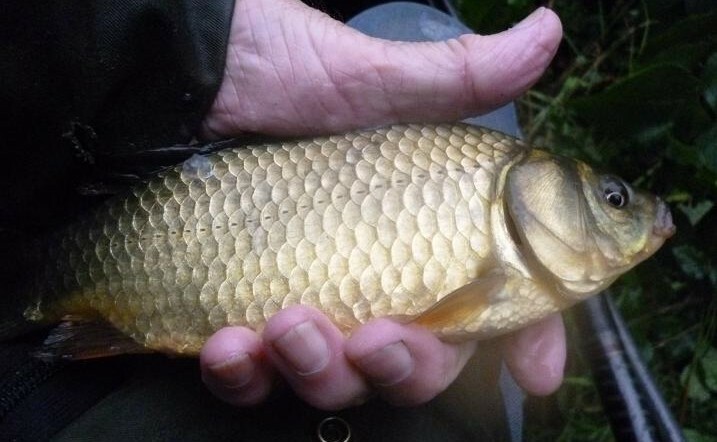 I also caught a few small tench, like a bar of wet soap, they slip through the fingers, writhing with the strength of fish much larger, unable to capture a picture for the camera. The rain kept falling, while crucians were first to the bait. 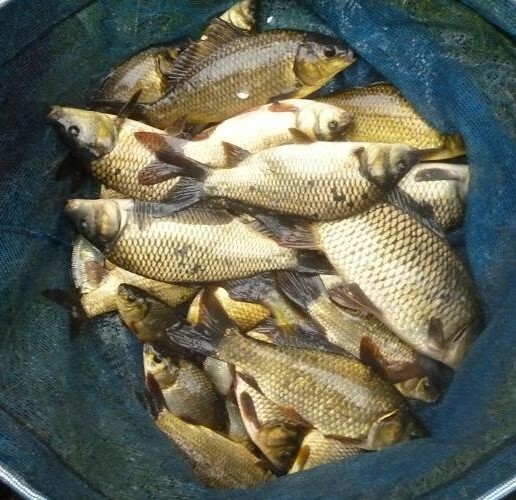 This was the best crucian carp; of around a pound, it made it to the weed bed, coming in festooned with the stuff, the fish not having a scale out of place. By 5:30 pm, the rain had soaked through to my back and arms, deciding that the next fish would be my last, being rewarded by another clonker. The other two anglers had packed up soon after the rain had started, watching me for a while, before heading off to their cars. 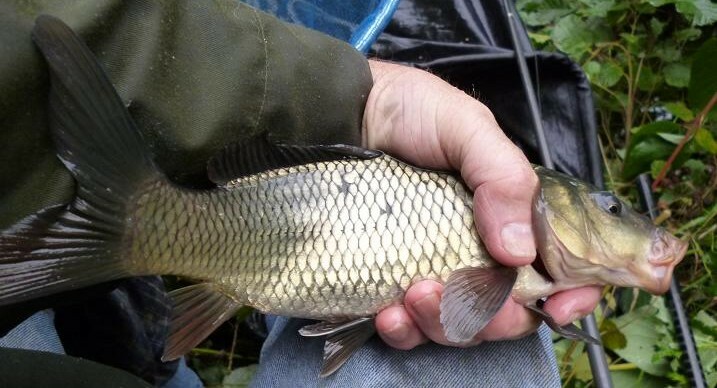 Fishing maggots, they had been plagued by small rudd, plus the odd good one, but had no carp. I bet they have some corn next time. Pulling in my keepnet, I could hear that I had a decent bag, the net bouncing my 15 lb scales.